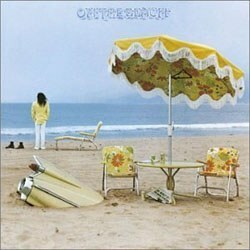 On the Beach is the fifth solo album by Neil Young and it was released in July 1974. As usual, Neil Young produced it together with David Briggs. Mark Harman and Al Schmitt were also part of the producing. As contrary to the previous album Harvest, On the Beach wasn’t a commercial hit. The quality of the songs was in a more subtle level and the harmonica was no longer present (except for in "Motion Pictures" and "Ambulance Blues"). Instead of the country feeling there were some soul and some funk to it. And Neil got stuck to the slow blues in “Vampire Blues” and "On the Beach". In other words: Neil Young wasn’t going to repeat a winning formula, but to deliver something different. By listening to the lyrics it becomes clear that these songs are written in disillusion mood. Even if it wasn't a theme on the album, the relation between Neil Young and Carrie Snodgress was at the time moving against its closing stages. Even that many songs from the album lacks the melodic grandeur Neil had showed before there are strong songs, and especially among some of the slower tunes like "See the Sky About To Rain", "On the Beach" and "Ambulance Blues". The album cover is of course a hit in itself. Neil Young came up with the idea and the photo is taken at Santa Monica Beach. The design was done by Gary Burden.